It wasn't until recently that I recognized the value of a bipod on a rifle. It started with me getting an inexpensive bipod for Christmas last year. This was also the time I was tricking out my AR-15. It was not long before I recognized that a bipod is extremely useful. First of all, when tinkering or cleaning your rifle, a bipod will keep the rifle in a good position and maintain stability while it is sitting on the work bench. Then, it's greatest value is when shooting your rifle. For those of you who have already owned one for years, you are probably thinking I'm a dufus. Maybe I am, but that is another review. The reason I never recognized the value was that whenever I hunted, I always paid extra attention to make sure I have a rest for my rifle when taking longer shots. Therefore I didn't feel that I had the need for a bipod and thus never purchased one. I'm not saying that it will be on my rifle every time I go to the deer stand, but I am saying there is a time and a place for nearly everything. Since I already had a smaller cheaper bipod, my main reason for getting a new bipod was to allow me to shoot from a sitting position. I have many coyotes on my property and am stricken with a beaver plague in my lake. In my mind, a taller bipod would allow me to be on the move and setup quickly for a sitting stable shot that will most likely be greater than 100 yards. When I started searching for a bipod that would meet this height requirement, I ended up focusing on the Harris Bipod Series S Model 25C. I'm not trying to knock Harris, but if you clicked on the link above, you would have seen that their description "Extends 13 1/2" to 27" Three Piece Standard Legs, "S" Series (Swivels)" and photo (below) didn't seem like the amount of information my engineering mind wanted for a bipod that has a "discounted" price of over $110. I'm hoping I can fill in a few gaps with this review. What's in the bag? Not much other than the bipod, instructions and a promotional flyer showing other Harris products. The bipod comes as a single assembly and is fully assembled. When Harris says "Three Piece Standard Legs", they are referring to the number of sections in each leg (three) and that the bottom leg will extend to only one position (full out). The two photos below show the legs fully collapsed and then one leg with all pieces full extended. When each leg reaches it's fully extended position, it locks firmly in that position. To collapse the leg from it's fully extended position, you would press on the spring loaded locks. I'm calling the lock the bent piece of metal on each leg. Each section that extends has it's own lock. WARNING: If you press the lock, the leg is spring loaded to retract. If your hand is in the right place when this happens, you will end up with a serious pinch. This usually only happens once and then you are aware in the future (at least I am). The middle section is infinitely adjustable by tightening the round knob which will lock the middle position in the upper section. This knob also has a roll pin that contacts the edge of the lock housing to prevent it from being screwed out and lost. 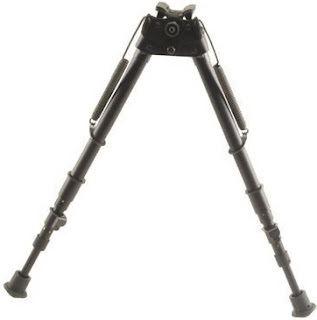 "Extends 13.5" to 27" - Harris measures these positions (fully retracted and fully extended) from the top of the tripod (bottom of the forearm) to the bottom of the feet when the tripod legs are folded down. I would consider there to be two other standard positions. The first is with the second section extended and the third section retracted. The second is with the second section retracted and the third extended. This gives you two other standard heights of 19.13" and 20.75", respectively. Actually, I find that these two intermediate heights may be the best for a quick sitting on the ground shot, depending on your height. All four standard positions are shown below. "Swivel Series" - This feature allows you to level your rifle (make your horizontal crosshair actually horizontal) in places where you don't have a level ground to setup for the shot. If the ground is extremely unlevel, you can use the infinity adjustment feature to level your rifle. You can see how much of an angle you can correct with the swivel feature by looking at the photo below which has the rifle swiveled all the way to one side. It can also swivel the same angle in the other direction. The swivel feature is spring loaded by a leaf spring on each side to bring it back to the vertical position. You can see this in the photo below and the spring is under the area that attaches to the rifle. You can adjust the ease at which the system will pivot by tightening the knurled knob on the pivot bolt. If you tighten it down hard, it can nearly become a fixed joint (if you are man enough). Also notice the sling swivel stud below the knob. You can still use a normal sling on your rifle even with the bipod installed. Finally, notice the dense rubber pad that is intended to contact your rifle when installed. Your rifle attaches by positioning the grab bars up through the slot in the upper attachment plate so that the sling stud will fit between the grab bars and the pins on each bar slide inside the hole in the sling stud as shown below. As you tighten the knurled knob on the bottom of the attachment area, it will pull the grab bars down into the attachment plate which will secure the bipod on your rifle. Honestly, in the beginning, I thought this was a "Mickey Mouse" way to be attaching a bipod. After checking it out, this ends up being a very secure method to attach a bipod and most hunting rifles will have a sling stud (eventually). I believe that Harris puts out a quality bipod product. Their overall costs seems high, but when you consider the complexity of the product and number of parts, it is probably about the right. The bipod seems very secure on the rifle and all the components functioned flawlessly. The only thing I struggle with is that when compared to a picitanny rail bipod, this one take longer to take on or off because of the issue of feeding the grab bars up through the attachment plate and hooking them on the sling stud, which in the end may be only 15 seconds of fiddling. So, I don't have any major issues with the Harris bipod and do believe it is a very nice product. Excellent review - just what I needed to know. yes!! this is what I was looking for. not just a picture of the product, but real live application. thank you very much for your time and clarity. Fitting a Harris bipod to my 300wm and I had a lot of questions in relation to that exercise. You just answered them all for me. Brilliant description - leads me to seriously consider joining the bipod crew! I'm 6'5 and have not found a bipod that I can sit upright and shoot with. Will the 27" be high enough for me? I suggest taking any stick and holding it at a height that is comfortable for you while resting the forend of your rifle on your hand holding the stick. Check your height on the stick and I believe if you are sitting on the ground it will be well below the 27" mark. I actually prefer to us it at the 20.75" height and lean forward to rest my elbows on my legs. I'm 6'2". Great review! I've owned a Harris bi-pod for many years (20+) and loved it, I especially enjoy being able to quickly detach and switch it to another rifle when necessary. It's a quality product, and I'd buy another in an instant if I needed another for some reason. Like you, I don't understand why they don't do a better job of promotion on their website. They barely tell you what the product even is! dude, tell harris to put you on their payroll. That's funny. I couldln't even get them to send me a free bipod. Doesn't matter. They make great products. Pretty good review. Thank you for taking the time. However; you made no evaluation of the usefulness on various rifles. Your AR is fairly light, in heft as well as recoil. However; I just got a Noreen BN36, weighing 8 lbs or so, with a 22" barrel, chambered for the vastly more powerful 30.06. I think all of your readers might benefit from your thoughts on the bi-pod's ability to stand up to greater weight, and much more recoil. Thank you, again.